A TENS machine consists of a small box that transmits small electrical pulses to specific areas on your back via wires and the use of three or four small adhesive pads. The box itself can vary in size, although it is typically the size of a pack of cards. The adhesive pads are placed either side of the spine at bra-strap level and two either side of the spine approximately level with your coxics. Application of the sticky pads can be tricky to do yourself, so ask your midwife or birthing partner for assistance. Once applied, you can control the intensity and frequency of the electrical pulses according to how much pain you are in. The theory behind TENS machine is that the electric pulses cause your body to release endorphins, which are natural chemicals that make you feel good. These 'positive signals' to the brain block the slower-moving pain messages coming from your cervix and womb. 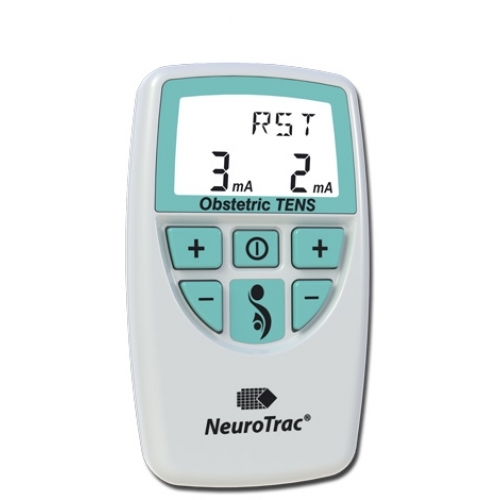 Information on the Neuro Trac Labour Tens Machine: The NeuroTrac Labour TENS is an advanced and modern digital dual channel TENS unit featuring a dedicated Labour Pain programme. Three different treatment modes provide maximum flexibility for pain relief. Used throughout the NHS, this is an excellent machine that is reliable and easy to use. Our Tens Machine also comes with a Remote Boost switch for additional pain control at times of intense pain. The NeuroTrac Labour TENS Is dedicated to treating Labour pain and is not recommended to be used for any other purpose. This unit should only be used during Labour. TENS can help with obstetric or Labour pain and has an 80% efficacy rate. If you are about to have a baby, the NeuroTrac™ Labour TENS may be able to help and provide a safe alternative to drug based pain therapy.